Wildcat Lake at Camp Mohican is now Catfish Pond, Blairstown, N.J.
One ingredient was water from Wildcat Lake, another was genuine bugs from under genuine Appalachian Trail rocks, and the last was lots and lots of sugar to help keep all those little campers excited about being away from home for two weeks. 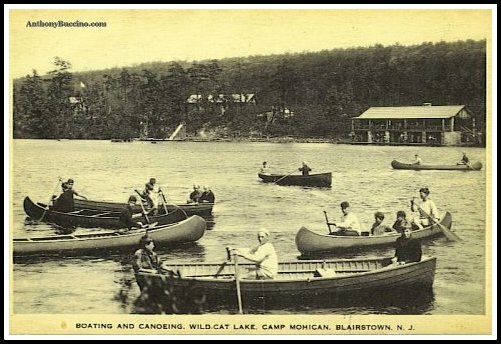 My on-line buddy has been keeping me up to date on what’s been going on at our old summer campgrounds, Camp Mohican, in the mountains of Blairstown in western New Jersey. He told me the lake was renamed from Wildcat Lake to Catfish Pond. He said that after it closed as a scout summer camp, they filmed the "Friday the 13th" movies with Jason and the goalie mask here. It’s a little known secret that what made Jason go mad and kill off all those promiscuous teen-agers was when he learned what went into the bug juice. My first overnight camping trip was at the scout camp at Wildcat Lake. It was a cold Friday night in January and we lugged our equipment up the trail to the rustic open-air cabins. Our troop leader and the older boys draped the tents across the front and sides. Shining our green handled right-angle flashlights into the dark woods we scampered through the cold evening prying frozen logs from the crusty ground. A wet-boot detail disappeared with the Jerry jugs and returned with the water we would need for the night. A coffee pot and some large sauce pans were set on the open fire to boil the lake water. We watched wide-eyed as the fire sizzled, logs popped and cracked. The smoke burned our eyes and clung to our clothes in the excitement of the first night of camp. Later we huddled in flickering shadows of the kerosene lamp as the wind whistled through the tent flaps on the front of the cabin. The older kids told dirty jokes that were outrageously funny to pre-pubescents, and we laughed loudly into the rainy night from within the slim protection of sleeping bags. The next day our leader took as many of us as he could carry in his car and drove to a clearing. From underneath some junk in the trunk, he produced a shotgun. Then he showed us how to hold it. We each got a chance to shoot the big gun and feel the recoil smack against our shoulder. Then it was back to camp for lunch, kitchen patrol, a quick hike to the lake, then prepare dinner for a bunch of hungry boys. At night the campfire roared and we huddled bravely against the cold windy night. The older campers who had been to this camp before stood on one side and the new campers were on the other side. From there we were introduced to a secret society where we were each given a new name. As each new camper stood before the veterans, our leader called on the veterans to name the recruit. When the name matched the recruit, such as Pajama Top or Jelly Belly or Slow Poke, the leader gave his approval. As the recruit spelled his new name, our leader hauled off with a his long-handled broom and for each letter in the new name smacked the rump thus imprinting the secret society name into the new recruit who would always have that name for that camp, forever more. It wasn’t only the recruits who got their bottoms warmed in the secret camp name game. When the veterans couldn’t think of an appropriate name for the recruit, the vets would then feel the whip of the broom whiskers prod them into thinking new and creative names. This was a lesson in creative thinking the young campers would carry with them in their adult family lives. Summer camp was made affordable here by allowing us to kick in an extra dollar at each of our weekly meetings. 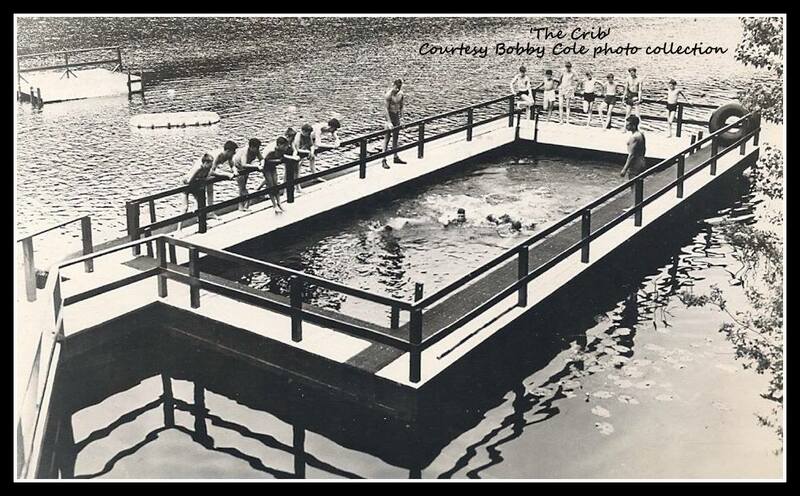 At summer camp, we boys were tested for swimming before being released to the pleasures of Wildcat Lake. We took our swimming test in the wooden dock-like pool moored at the edge of the lake. We had to swim a four laps each way in the crib without stopping. If we did that, we had to jump into the deep side of the dock and ride a bicycle – that’s the technical camp name for the swim stroke we used – for a set time then swim to the dock. That routine proved who the swimmers were. As for those who didn’t pass the test on the first day, we practiced swimming in the safety of the crib while the rest of the campers enjoyed the pleasure of canoeing, rowing and swimming in the wide open lake. Anyone who did not pass the test after the first week when our parents visited on Sunday was given one more chance Monday morning to pass the swim test. Anyone who did not pass had his nose painted red with mercurochrome. Once we were painted with red noses, even if we learned to swim the next day or the day after that, the dye didn’t wash off till it was time for our parents to pick us up on the last day of camp. Perhaps it was the same red stuff they used on our noses that turned the breakfast, lunch and dinner beverage of campers we called bug juice its delightful shade of liquefied Jell-0? I asked my on-line buddy if he knew what was used to concoct the famous bug juice. But, of course, he reminded me, that is a trade secret and as such is profoundly protected by trade marks and a fellow named Jason wearing a goalie mask. If you are hiking the Appalachian Trail, and you run into Jason, it’s best not to broach the subject. He’s funny about those trade secrets, as you might have noticed from his movies. 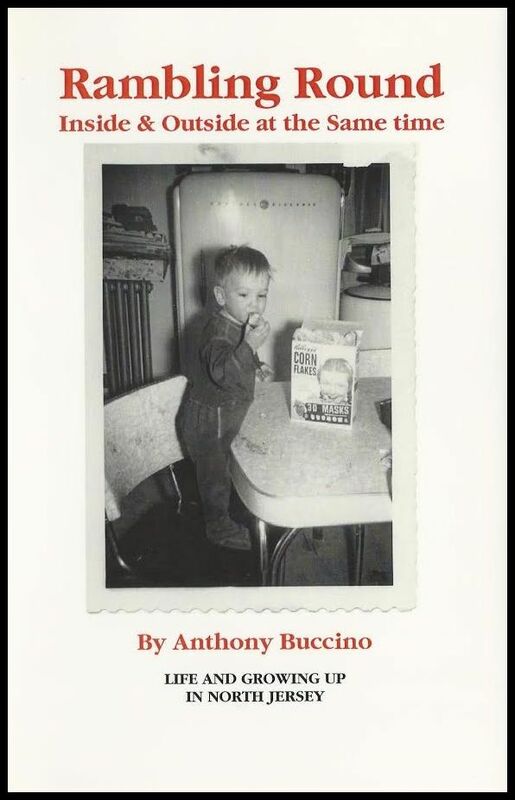 Copyright © 1997-2018 by Anthony Buccino, All Rights Reserved. First published in Worrall Community Newspapers on July 24, 1997. 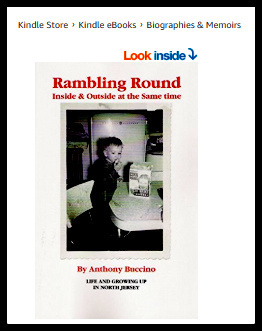 This essay was adapted from RAMBLING ROUND Inside and Outside at the Same Time. Newark Area Council/Robert Treat Council, Newark, New Jersey: scouts from Newark, Elizabeth, and surrounding areas. The council moved from an earlier Camp Mohican in the Palisades area of New Jersey. The council was named for Robert Treat, a founder of the city of Newark in the 1600s. Google Map of Blairstown, N.J. Links subject to change, wither and disappear.